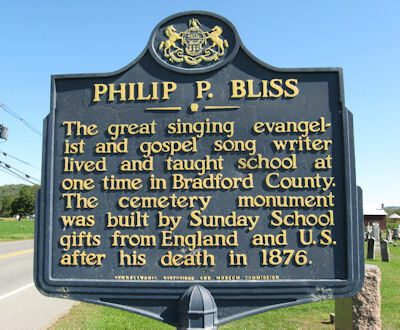 Rome Cemetery, Rome, Pennsylvania, U.S.A.
Philip P. Bliss (1838-1876) was an American hymn writer and Gospel singer who wrote the words and music for such hymns as "Almost Persuaded," "Hallelujah, What a Saviour!," and "Let the Lower Lights Be Burning." 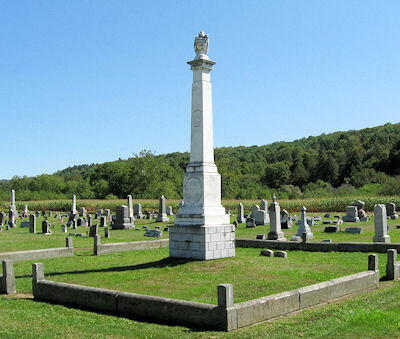 Lucy Young Bliss (1841-1876): Born March 14, 1841 in Rome, Bradford County, Pennsylvania, U.S.A. Married Philip Bliss June 1, 1859. They had two children. She and her husband died in a train disaster in Ashtabula, Ohio, Friday evening, December 29, 1876, when a bridge gave way and the passenger cars plunged to the ravine below. Historical marker for P. P. Bliss memorial, Rome, PA..
North of Village on Route 187/Main St./Rome Rd. Guide to the Philip P. and Lucy Bliss Memorial, Rome, PA.
P. P. Bliss Gospel Songwriters Museum. 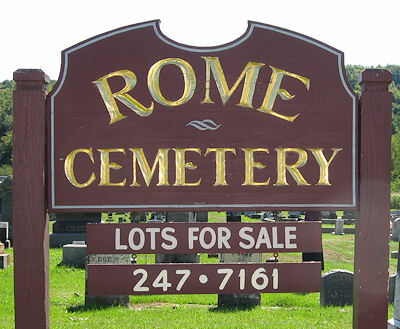 Rome, PA.
Photographs by Stephen & Dorothy Ross for WholesomeWords.org 2008-2009.